As the weather gets colder, my skin gets a hell of a lot drier. Come in: Rosehip PLUS Skincare. Rosehip PLUS Skincare is a brand coming over from Australia who’s products surround one key ingredient – Rosehip Oil. They searched the globe for the best kind, eventually found in Chile, and in 2012 launched their first product, rosehip oil. In 2014 they launched two more products, their day and night creams, and have since launched a cleanser too. I’ve been gifted their day and night creams to find out what all the fuss is about. So, what is Rosehip Oil? 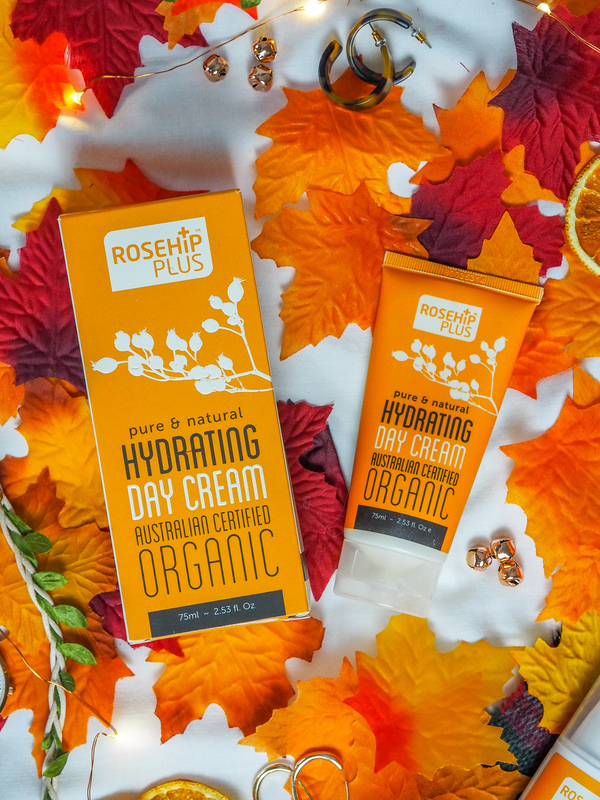 According to Rosehip Plus’s website, Rosehip oil is Oil, Rosehip Oil is a fruit oil that has been extracted from the seeds of the rosehip, an amber berry-like fruit that grows wild on rose bushes and is left behind after the rose has flowered and dropped its petals. This is then cold pressed and extracted from the seeds of the fruit without the use of solvents and chemicals to guarantee that you receive only the purest and highest quality oil. Top quality certified organic Rosehip Oil like have no added fragrances, colour or preservatives. The natural fragrance of Rosehip Oil is quite subtle and can be described as having a woody and toasty aroma. 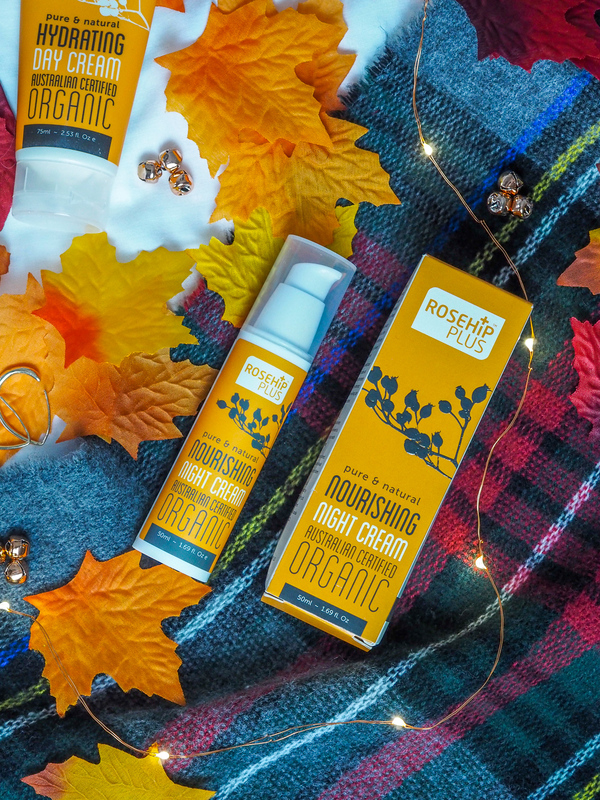 Rosehip Oil is rich in skin-loving naturally occurring vitamins, antioxidants and essential fatty acids, such as Vitamin A (Retinol) and Vitamin C, essential fatty acids Omega-3, 6 and 9, as well as Lycopene and Beta-Carotene to help keep skin hydrated, moisturised and younger looking. It can also help reduce the appearance of stretch marks and scars, maintain skin hydration and softness, improve the appearance of dry and sensitive skin, minimise the appearance of fine lines and wrinkles, and promote skin elasticity and texture. Sounds good, right?! I was gifted both the Rosehip PLUS Day Cream, and the Night Cream, and I’ve been using both in my morning and evening skincare routines for a while now. 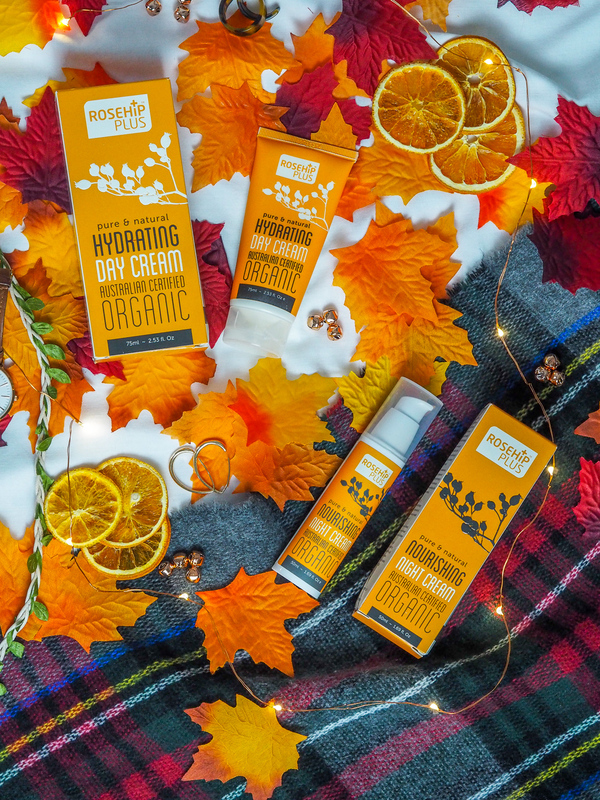 Starting with the Hydrating Day Cream, this is made with 100% pure Certified Organic cold pressed Rosehip Oil as well as a blend of chamomile, avocado and rose geranium, which supports and encourages a healthier looking skin. It’s a daily facial moisturiser which I’ve been applying after my usual morning cleanse and tone. The texture of this is more watery than I was expecting, but nothing as near as liquidy as the Clinique moisture surge, for example. The benefit of this formula is that a lot goes a long way. I only need a pea-sized amount every day so I know this will last me a while! In terms of performance, it does its job. My skin feels moisturised and it creates a great base for my make-up. Next, the Nourishing Night Cream. Like the day cream, this contains Australian Certified Organic cold pressed Rosehip Oil, as well as a blend of cocoa seed butter, jojoba seed oil and shea butter which helps to lock in moisture and deeply nourish the skin’s surface. This has been sat on my bedside table for a while now, and I’ve been applying a small pump every night. I love the design of this bottle – far more than the day cream because it’s easy to use, although I don’t think this tube will last as long as the day version. I’ve loved using the night cream, it moisturises my face perfectly, without feeling too heavy or greasy on my skin. Overall, I’ve loved using both products and learning more about Rosehip Oil. They do just what I need in a moisturiser and they’ll stay on my dressing table and bedside table for the rest of winter for sure! Have you ever heard of Rosehip Oil? Or tried Rosehip Oil products?